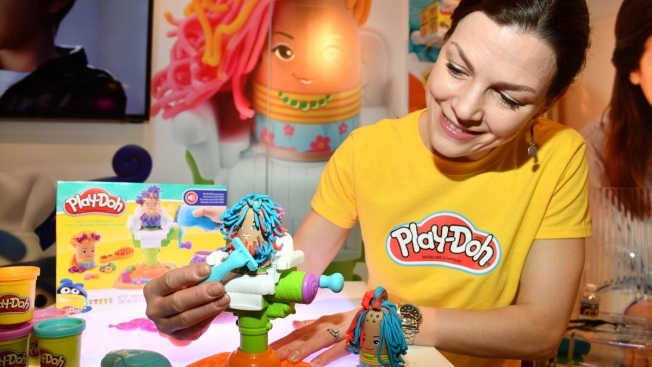 In this Feb. 18, 2018, file photo released by Hasbro, a demonstrator at the Hasbro, Inc. showroom creates fun trims, cuts and styles with the PLAY-DOH BUZZ N' CUT playset at the American International Toy Fair in New York City. Hasbro has trademarked the scent of Play-doh. The toy company on Friday announced that the United States Patent and Trademark Office has recognized Play-doh's distinctive smell with a registered trademark, something rarely issued for a scent. The Pawtucket, Rhode Island-based toymaker describes it as a "sweet, slightly musky, vanilla fragrance, with slight overtones of cherry, combined with the smell of a salted, wheat-based dough." The Play-doh brand has been around since 1956. Hasbro applied for the scent trademark last year. The company says in a press release that the smell "has always been synonymous with childhood and fun" and explains that the trademark allows it to protect "an invaluable point of connection between the brand and fans." There are already some Play-doh-scented products available online, including cologne and soy candles.